Attendees from the inauguration ceremony for NCC are posing for a portrait. From left are Director SuRae Jang (Ulsan Creative Economy Innovation Center), Group Leader Man Sik Lee of KITECH, Gil-Bu Kang (National Assembly member), President Mooyoung Jung of UNIST, Director Jae Sung Lee (Vice President of Research Affairs), and Prof. Hyeon Suk Shin (Dean of Office of Budget and Planning). Securing Fundamental Technology for the Next-generation catalysts. 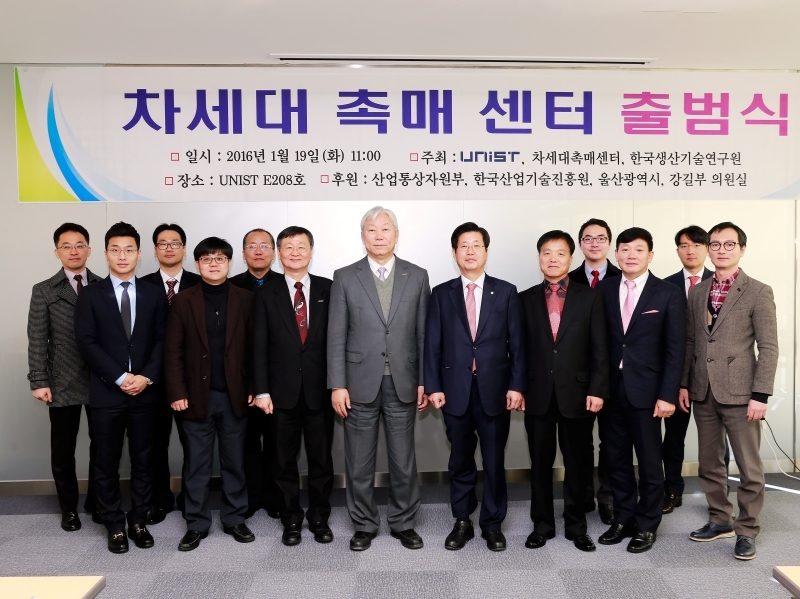 The city of Ulsan has launched a new research center at UNIST to promote fundamental research on catalysis and contribute to researchers in this field. An inauguration ceremony for the Next-generation Catalysis Center was held in the morning of Tuesday, January 19th, 2016. The ceremony was attended by 50 guests affiliated with the center, including Director SuRae Jang (Ulsan Creative Economy Innovation Center), Group Leader Man Sik Lee of KITECH, Gil-Bu Kang (National Assembly member), President Mooyoung Jung of UNIST, and Director Jae Sung Lee (Vice President of Research Affairs). Lacking in technological capability, South Korea’s chemical industries have been relying almost completely on imported foreign technologies. Therefore, implementing the development of the fundamental technology for the next generation catalysis is pivotal. 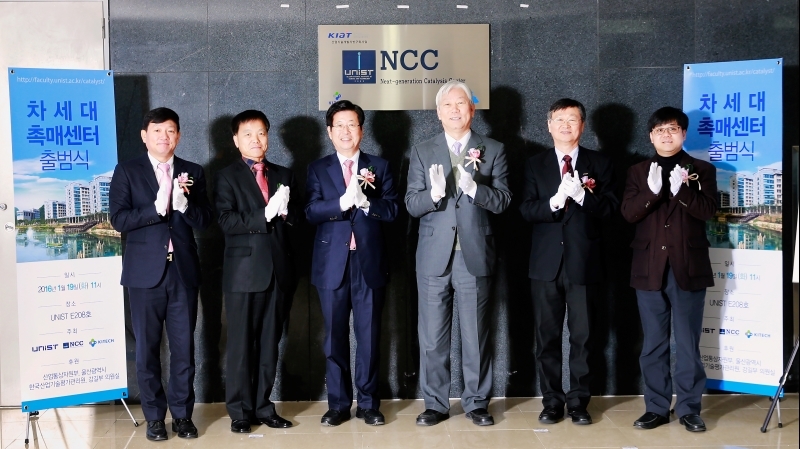 In conjunction with the city of Ulsan, the Next-generation Catalysis Center (NCC), led by Director Jae Sung Lee (Vice President of Research Affairs, UNIST) will step in to help improve the competitiveness of South Korea’s chemical industry. The center aims to serve as a platform for collaborative research efforts, fostering the interaction between industry national labs, and academia. The mission of the center is to promotes quality and innovative research in the area of catalysis and to educate a new generation of catalysis researchers in the theory and best practices of catalytic science. The center will receive financial assistance to support for the next five years of catalysis R&D. As for now, they have raised 5 billion won from Korean government, 5 million won from the city of Ulsan, 2.25 billion won from UNIST, and 7.5 million won from Korea Institute of Industrial Technology (KITECH).